In August 2003, I built a 4x8 simple layout for my grandson. The conceptual plan below represents a simple, low-maintenance layout suitable for kids. It offers enough features to be entertaining yet has realistic scenery. Plan view of proposal for this simple O-gauge model train layout. There are two loops (one for his MTH Pennsylvania Express freight train pulled by a 2-8-0 Consolidation steam locomotive and one for his K-Line Tuscan-red Pennsylvania Railroad GG1 electric loco, pulling a set of Williams PRR Congressional passenger cars). There is also a point-to-point line for his Industrial Rail reversing trolley car. 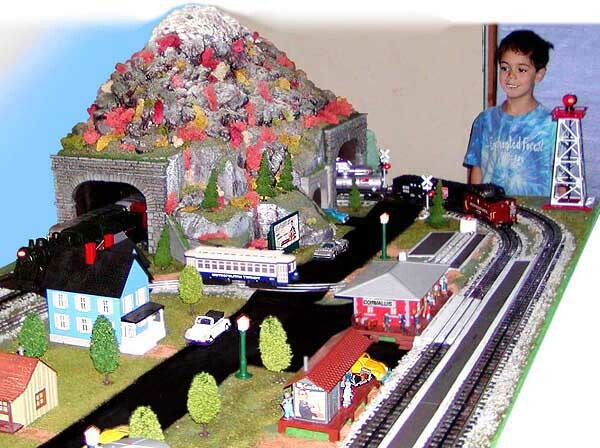 The layout features a tunnel, crossing flashers, a flashing billboard and a rotating beacon. All buildings are internally lit and there are street lights so it looks good at night. There is a log dump area to accommodate my grandson's operating log-dump car. 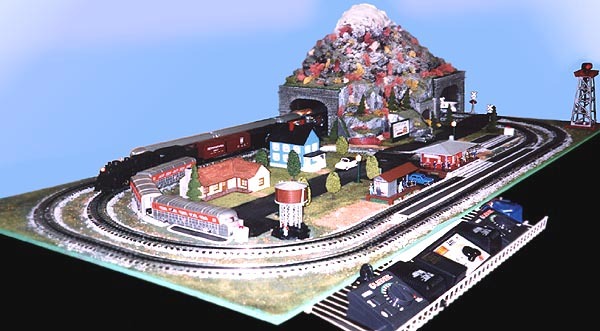 Overall view of the layout. The Congressional passenger set is on the outside loop; the freight set pulled by a steam loco is on the inside loop. (In the above photo, three silver passenger cars are parked on the trolley tracks.) All buildings are internally lit and the rotating beacon can be seen at right. Freight station in foreground, Corvallis passenger depot is next to it. Note brakeman waving from PRR caboose at far right of photo. A big surprise - my grandson is introduced to his new train layout. Note the reversing trolley car crossing roadway.